Founders Peg Tileston and Rod Cameron were honored in Seattle earlier this fall for their work establishing Trustees for Alaska. The Board of Directors of Trustees for Alaska is proud to announce that co-founder Peg Tileston was reelected after a 33-year hiatus. 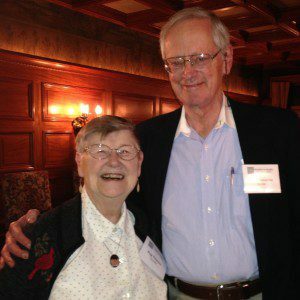 Peg was instrumental in starting Trustees for Alaska in 1974 along with co-founder Rod Cameron and several other Alaska conservationists. Peg was the on-the-ground Alaskan while Rod had the legal background and connections to our initial funders. Together they were the perfect team to start Alaska’s only homegrown public interest environmental law firm. Both Rod and Peg were honored for their dedication last fall for the fortieth anniversary of Trustees for Alaska. Peg’s vision has lasted 40 years. Trustees for Alaska’s goals of protecting and defending Alaska’s natural assets haven’t varied since its inception. Our success is grounded in those early years and by the foresight of our original leadership—Peg Tileston. 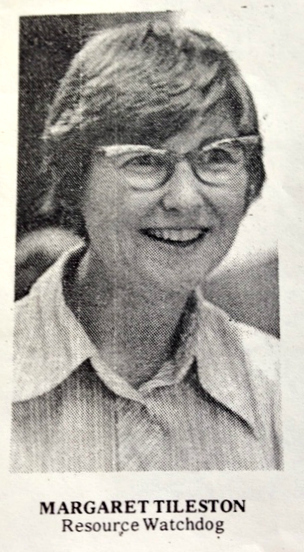 Peg, circa 1974, took a lot of heat from the local press when she worked to establish Trustees for Alaska. Peg is a dedicated Alaskan and remarkable woman. Her history of starting public interest nonprofit organizations in Alaska is unprecedented. In addition to initiating Trustees for Alaska, she helped found and shape the Alaska Center for the Environment, Alaska Conservation Foundation, the Alaska Women’s Environmental Network, and Alaska Common Ground. She has served on boards and been a volunteer for many other organizations as well. Peg was voted into the Alaska Conservation Hall of Fame and inducted into the Alaska Women’s Hall of Fame, and received many other honors and awards over her lifetime. Since 1999, Peg has tirelessly produced What’s Up, a weekly calendar of everything an Alaskan conservationist needs to know from public comment periods to announcements, to events and job postings. She served as Trustees for Alaska’s Board Chairwoman for eight years until 1982. Peg currently also serves on the boards of the Alaska Center for the Environment and Alaska Common Ground.